Snap Inc. has rendered the phrase “take a picture, it’ll last longer” meaningless. The company that invented the ephemeral picture messaging app Snapchat is often compared to a rocket ship. In many ways, it is transforming the way we interact with each other, and it’s moving at about the speed of light. Snap Inc., which changed its name from Snapchat in September 2016, is the latest craze in social media. It’s a company constantly in transition, which can mean some very high highs and some low lows. Snap Inc. jobs are coveted by many who want to be on the ground floor of an innovative and exciting company. But is Snap the right company for you? We’ll get into salary information below, but first, let’s take a look at what it’s like to work at Snap. Like many social media companies, Snap was started in a dorm room. A Stanford dorm room, to be exact. It was created by Evan Spiegel and Reggie Brown for a class project. Bobby Murphy was later brought in to write the source code for what launched as Picaboo. Reggie Brown was ousted from the company shortly after the launch in 2011, and his contribution is disputed by Spiegel and Murphy. Snap went public in early March of this year. Though the stock has dipped and analysts are bearish, investors are still excited about the company, which seems to be in a constant state of transition. Over the past year, Snap has doubled its employee numbers — from 1,000 to 2,000. There are now sales teams in Canada, the U.K., France, Germany, Australia, and the Netherlands, in addition to the United States. As of spring 2017, the app has 166 million users. This shift has allowed Snap to move beyond the app with products like Spectacles, a pair of sunglasses that capture video. CEO and co-founder Evan Spiegel is the machine that keeps the company running. He’s the idea man, and reportedly makes all of the decisions. This can cause friction with some people who work there, but others enjoy the ride of working with a visionary. The culture at Snap is different than many other tech companies. First, it’s headquartered in Venice Beach, California, rather than Silicon Valley. Employees work in various buildings in the neighborhood, not in one centralized location. And the company doesn’t even pretend to be open or transparent. Spiegel is a stickler for privacy, both in his personal life and his business life. The company operates in secrecy, where some employees remain unaware of new products until they’re announced in the press. In many other big tech companies, employees are often the first to test out new products. But though the CEO sits behind a locked office on the top floor of one of the Venice Beach buildings, the people at Snap are working on some of the hottest ideas in the industry, and that’s enough to attract top-tier talent. Snap is a relatively small company, but it now offers many of the same benefits as bigger names like Apple and Google. There is reportedly a free health plan — medical, vision, and dental — as well as a 3 percent 401(k) match, plus an additional three to five percent on half of the employee’s contribution. Family benefits include paid parental leave and assistance with infertility, adoption, egg freezing, and surrogacy. Employees receive free gourmet breakfast, lunch, and dinner at the Snap cafeteria, as well as credits for food at local cafes. There is also a monthly stipend to help cover your phone bill. 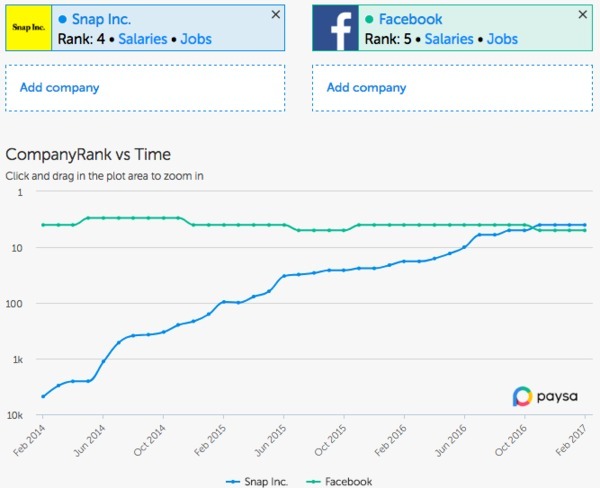 Paysa CompanyRank for Snap Inc. The Paysa CompanyRank algorithm measures the quality of technical talent at a company over time, based on our analysis of 7.45 million job changes across 198,000 companies over the past 15+ years. Snap Inc. currently has a CompanyRank of 4, putting it just above tech giant Facebook. That’s a pretty amazing feat for a company that has only been around for five years. Snap Inc. CompanyRank, per Paysa data. We’ve given you a quick rundown of what it’s like to work at Snap. Still interested? Then you’d probably like to know a little more about how much you can expect to be paid. The average market salary for an engineering manager at Snap Inc. is $281,000. That includes a base salary of $185,000 and annual equity of $96,000. 75 percent of applicants must know C, and 55 percent must also know Objective-C. Other top required skills include software engineering, C#, programming, and C++. 70 percent of applicants have a bachelor’s degree, 30 percent have a master’s degree, and 16 percent have a Ph.D. 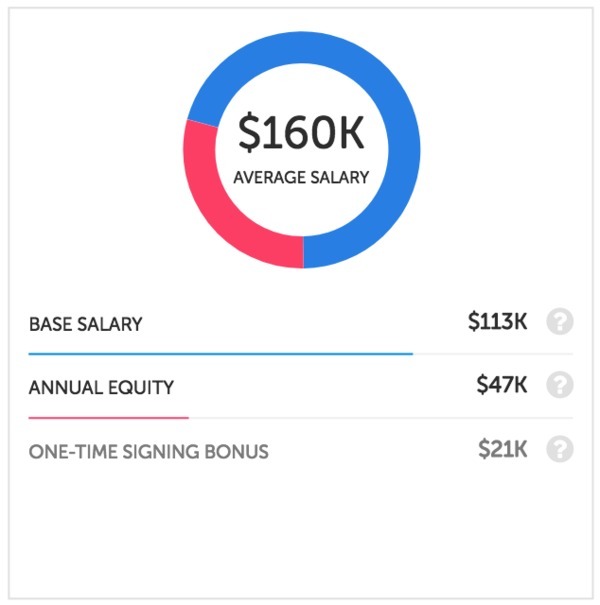 The average market salary for a designer at Snap Inc. is $160,000. That includes a $113,000 base salary and $47,000 in annual equity. There is also a one-time signing bonus of $21,000. 77 percent of applicants must know Photoshop, and 70 percent must also know Illustrator. Other top required skills include graphic design, After Effects, Illustration, and Adobe Creative Suite. 37 percent of applicants have a bachelor’s degree, and 14 percent have a master’s. 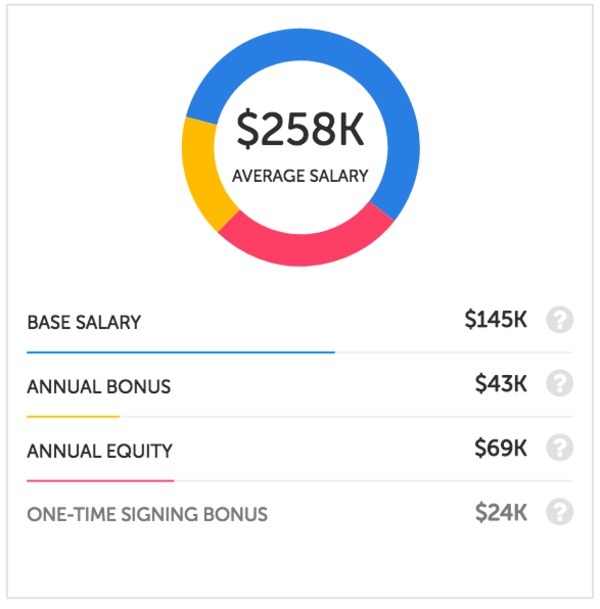 The average market salary for a product designer at Snap Inc. is $175,000. That includes a $123,000 base salary and $52,000 in annual equity. There is also a one-time signing bonus of $23,000. 56 percent of applicants must know iOS, and 52 percent must also know Java. Other top required skills include user interface design, interaction design, iOS development, and Objective-C. 50 percent of applicants have a bachelor’s degree, and 10 percent have a master’s degree. The average market salary for a product manager at Snap Inc. is $222,000. That includes a base salary of $155,000 and $67,000 in annual equity. There is also a one-time signing bonus of $25,000. 100 percent of applicants must know Java, and 98 percent must also know Python. Other top required skills include data analysis, Powerpoint, Latex, and macOS X. 50 percent of applicants have a bachelor’s degree, and 25 percent have a master’s degree. The average market salary for a research engineer at Snap Inc. is $194,000. That includes a base salary of $142,000 and $52,000 in annual equity. There is also a one-time signing bonus of $23,000. 100 percent of applicants must know algorithms, and 97 percent must also know Python. Other top required skills include C++, C, Matlab, and Java. 62 percent of applicants have a bachelor’s, 55 percent have a master’s degree, and 31 percent have a Ph.D. The average market salary for a research scientist at Snap Inc. is $223,000. That includes a $153,000 base salary and $71,000 in annual equity. There is also a $27,000 one-time signing bonus. 89 percent of applicants must know Python, and 61 percent must also know C++. Other top required skills include Java, Matlab, machine learning, and data mining. 61 percent of applicants have a bachelor’s degree., 43 percent have a master’s, and 40 percent have a Ph.D.
What’s It Like To Work At Snap Inc.? Snap is unlike many companies in the industry. CEO Evan Spiegel maintains a culture of secrecy he has likened to Apple under Steve Jobs’ leadership. Snap has some of the top talent in the business, and it is truly a rocket ship of a company. Only you can decide if you’re ready for the ride. Paysa is on a mission to shift the power from companies to employees via the democratization and distribution of real-time salary, job, and career insights. Sign up today for free to get personalized and customized data that will help ensure you get paid what you deserve.